English social leader and philanthropist; born in London July 27, 1851; died at Dalmeny Park, Scotland, Nov. 19, 1890; only daughter and heiress of Baron Meyer de Rothschild. Like her mother, Baroness Juliana de Rothschild, she was very active in philanthropic undertakings. In 1878 she married the Earl of Rosebery, but, notwithstanding this union, remained a Jewess, was a member of the Central Synagogue, London, and took a deep interest in the concerns of the community. She made Lansdowne House the focus of social Liberalism, and was an important element in the organization of the Liberal party. Lady Rosebery was especially attached to the Institution for the Oral Instruction of the Deaf and Dumb, and also associated herself with the movement for promoting a better system of nursing. She was appointed by the queen president for Scotland of the Queen Victoria Jubilee Institute for Nurses, and was also resident of the Scottish Home Industries Association. She took much interest in the condition of working girls and founded the Club for Jewish Working Girls in Whitechapel. She left two sons and two daughters; she was buried in the Willesden Jewish Cemetery. Jew. Chron. 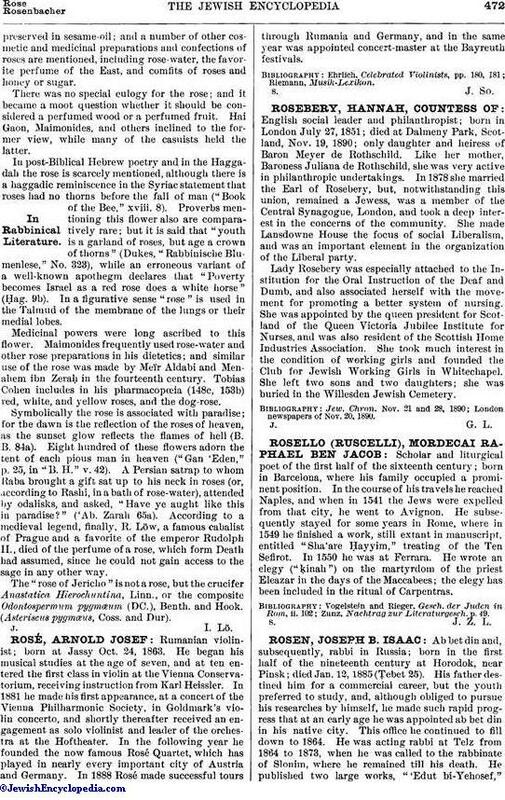 Nov. 21 and 28, 1890; London newspapers of Nov. 20, 1890.